I’ll keep this as intuitive as possible instead of spamming wall of text. Let’s begin by examining existing arguments. The counterargument is usually “Idling has been around for over 4 years”. I present you the concurrent active players of Team Fortress 2 since the beginning of time. The idea here is that the general amount of concurrent players for the past 2 years have increased, and if such increase includes idling accounts, 100 more concurrent idlers means 1700 more idling accounts because weekly limit of item drop is 10 hours per week, per account. A week has 168 hours. 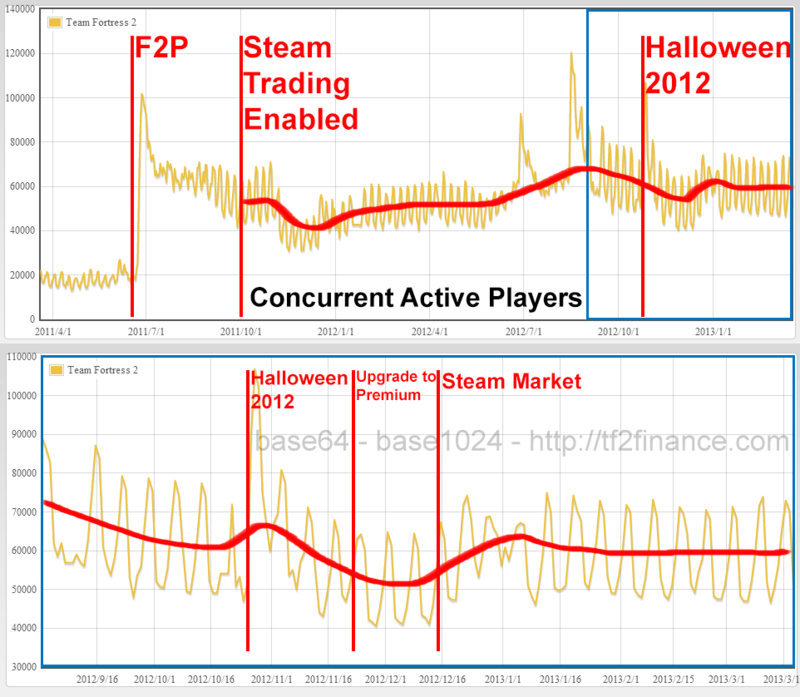 So 1 % increase in concurrent players solely caused by “Upgrade to Premium” cannot be underestimated. Another counterargument presented by folks is “The rise in Key prices predates Upgrade to Premium”. I can tell you that it’s not entirely correct. 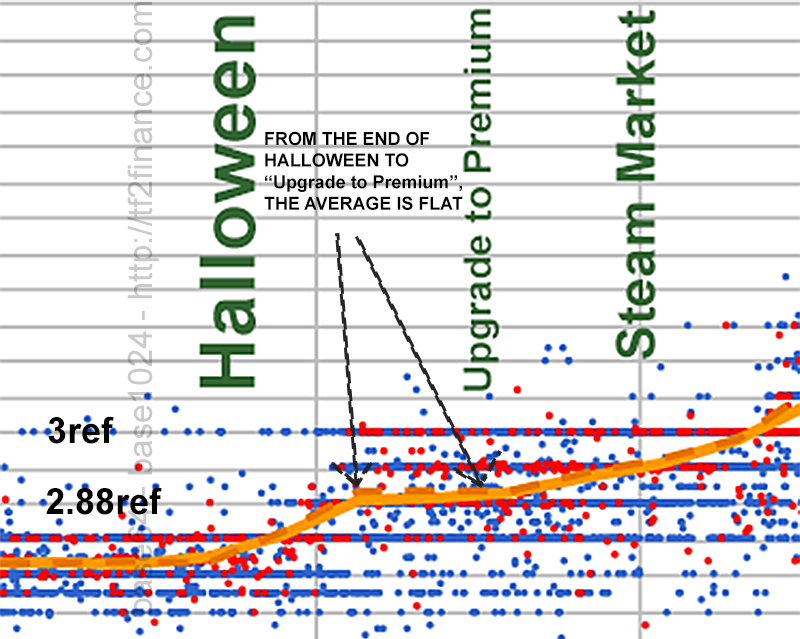 Halloween made Keys settled at 2.77 to 3 ref, with average consistent at 2.88 ref, and re-established the rising trend that has been ongoing for years (1 scrap per 6 months), it is “Upgrade to Premium” which might have triggered a more violent rising trend. But is that new rising rate caused by influx of new Metal? I’d say no, more likely it is caused psychologically, the anticipation of influx based on uncertainty (not actual quantity injected that week). It has sure decreased amount of Keys injected into the market each day compared to 6 months ago. We don’t know, but allowing official secondary market has definitely changed people’s preference towards holdings Keys as opposed to Refined, as Keys can be converted to Steam Wallet Money. “Preference” is a topic to be discussed later. People have been saying that the “Total existing Refined: Total existing Keys” from stats.tf has been decreasing, in the opposite direction of Key price. Allow me to propose the following questions. Who said that Exchange rate is totally reliant on Ratio of quantity existing (i.e. Money Supply in real terms)? So why are people recording the ratio presented by stats.tf each day to prepare for an argument in the future? Furthermore, stats.tf scans minimum 2.7 million accounts per cycle. It takes over 2.7 million seconds even at 1 unrepeated accounts per second. That’s over 750 hours, i.e. 31 days. And on the FAQ page, “The oldest active backpack was last updated on 2012-08-25 08:00:47”. In May 2012, there was a minimum of 50,000 backpacks that contained Keys, spread across 4 million non-empty backpacks, and each Key owner on average owns only 1 Key. It’s not easy to collect actual live quantity of Keys “existing”. In the so called 500,000 keys that “exist” as displayed at stats.tf, how many Keys are already turned into Stranges or Unusuals but not scanned yet? To give you can idea of how many Keys are used each year, it’s in the millions. So stop citing Keys existing or Ref existing. On the other hand, you can safely say that X number of Genuine items exist at minimum as displayed by stats.tf because they don’t get transformed or destroyed easily. Money Supply is totally different from Supply. Definition of Supply: The quantity of goods or services that producers are willing to sell different prices, over a certain period of time. At the price of 2.33 Refined, what’s the maximum quantity you are willing and able to sell right now? “If I had 10 Keys right now I would sell them all at 2.33” is not a valid answer, because you are not “able” if you don’t own 10 Keys. Hypothetical situation means nothing. For the buyers side, ask “How many Keys can you buy at 2.33”, instead of “What would you pay for 5 Keys”, because the answer will just be 0 Refined. Gather all info and sum the quantity to form the Demand/Supply diagram. The equilibrium price is where Quantity Supplied = Quantity Demanded AT ONE SPECIFIC PRICE. Therefore, we don’t assume that the entire world needs to convert millions of Refined into hundreds of thousands of Keys in the morning, and convert back in the evening. Owning Keys doesn’t mean the Keys have to be sold out 100% by the day. We keep currency for transactional purpose. 1. Someone sees price at Backpack.tf at 2.66 ref. This looks like a perfect argument, but the logical flaw lies with “Rinse and Repeat”. Let’s try to expand it. 1. Someone sees price at Backpack.tf at 2.66 ref and sells his Key on Outpost. 5. Outpost sellers tries to sell at 2.88 AND Someone sees price at Backpack.tf at 2.77 ref and sells his Key. There is a major flaw at step 5. Why would the majority of people buy at 2.88 if there are people selling at 2.77, AND people think that 2.77 should be the "true price" that shall be reported? Assume there no one who buys at 2.88 when 2.77 is available in one simplified case. Let’s say 5 sellers at 2.88 and 5 sellers at 2.77. Quantity demand at 2.88 includes those demanded at 2.77. If 2.88 doesn’t sell now that means Quantity supplied = (5+5) = 10 but Quantity demanded = 5. 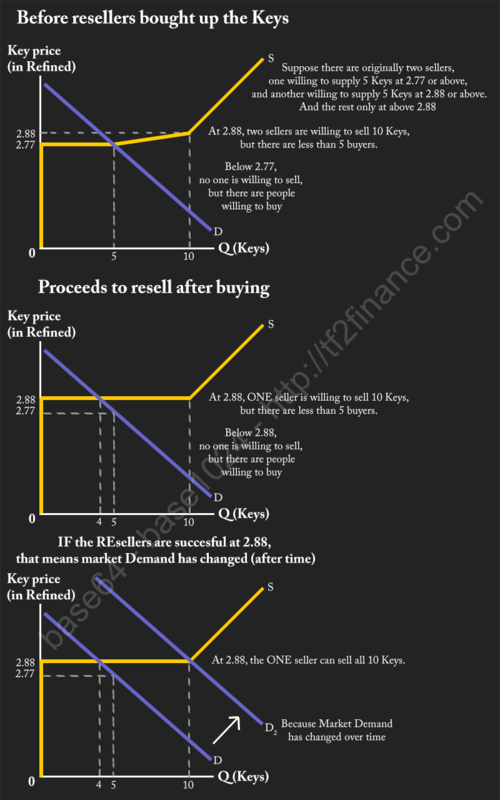 Now, the resellers buy the 5 Keys at 2.77 and resells at 2.88. Quantity Supplied at 2.88 is still (5+5) = 10, and Quantity demanded is still 5. Therefore, the whole reselling process is just for finding the next equilibrium price of time, and it is justified. Not able to find at lower price does not imply that buyers will shift the entire Demand curve to accomodate the sellers. Why can this simplified case be generalized to thousands of participants? Because Price Dispersion, or what traders called the "1 scrap range", has central tendency. It means that if 2.77 is the "true price", trades may happen at 2.77, 2.88 and even 2.66, but 2.77 will still account for the majority of trades. People may argue that the “new Demand” is from the next wave of speculators, but I can tell you that each “wave” makes the required “horizontal shift in Demand” larger, so the resellers need more capital to make such move. Equilibrium price of Keys has been changing constantly, it has a forever rising trend since 2011. Right now, data shows that it increases by 1 scrap every 7-10 days, and backpack.tf more or less ACCEPTS a suggestion every 5-10 days. However, keep that mind that such ACCEPTED suggestions contain changes of 1 weapon, or even less. We are talking about 0.03-0.05 ref here. Additionally, the community has learned though Classical conditioning that new suggestion posted = confirmed new price. The function of the official “last accepted price” is fulfilled by “most recent suggested price even before accepting”. People began to reference the voting page as opposed to the price guide page for spot valuations of Keys. As for the debate on backpack.tf's influence on market, reporting a false/outdated price will not change the final equilibrium, but reporting a higher price during the rising trend will speed up the market correction process. Backpack.tf does influence the market, but the influence is justified. When people argue that Backpack.tf has feedback effect, I think of this statement. "Thomson Reuters reports market price. When it reports a rising trend, the speculators will buy up the existing price, and Reuters will report an even higher price. The cycle repeats." Reuters is a provider of financial market data in real world. Replace Reuters with Backpack.tf and see how it sounds. As long as price reporters don't distort prices, it doesn't matter what the "feedback" is. Allocation of resources by free price system is a central element of Capitalism. Price signal is the only thing that makes allocation efficient, i.e. maximizing consumer surplus and producer surplus (profit). Another problem is that users refuse to quantity such change in relative terms. Therefore, the trend has been slowing down. We need to go back to Theory of Liquidity Preference. 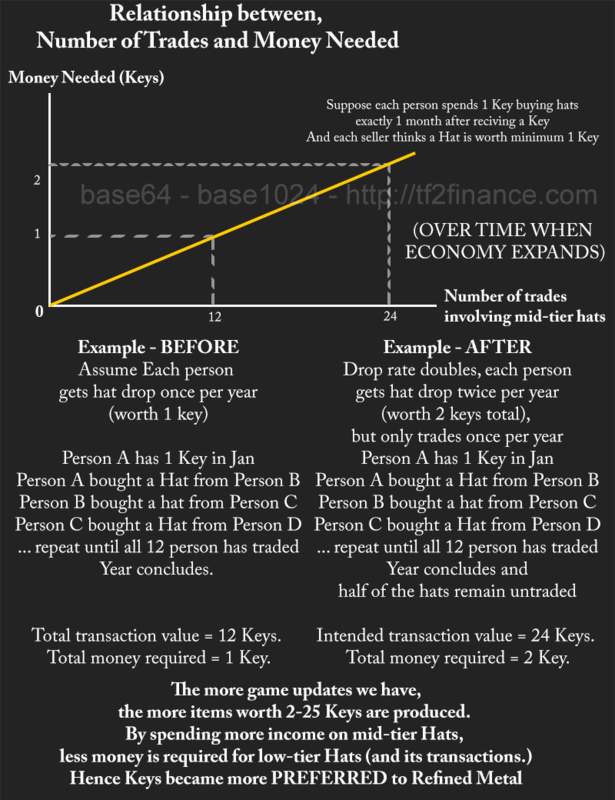 Demand for a certain type of currency increases as the economy for mid-tier Hats expands. No one can guarantee that unboxing during the next event can lead to $3 profit on average per unboxing as before, but it is still wiser to hold more Keys than Refined. So the Demand for Keys increases because Keys have possible “future return” even if you do nothing to it for months. This was briefly discussed in previous parts. 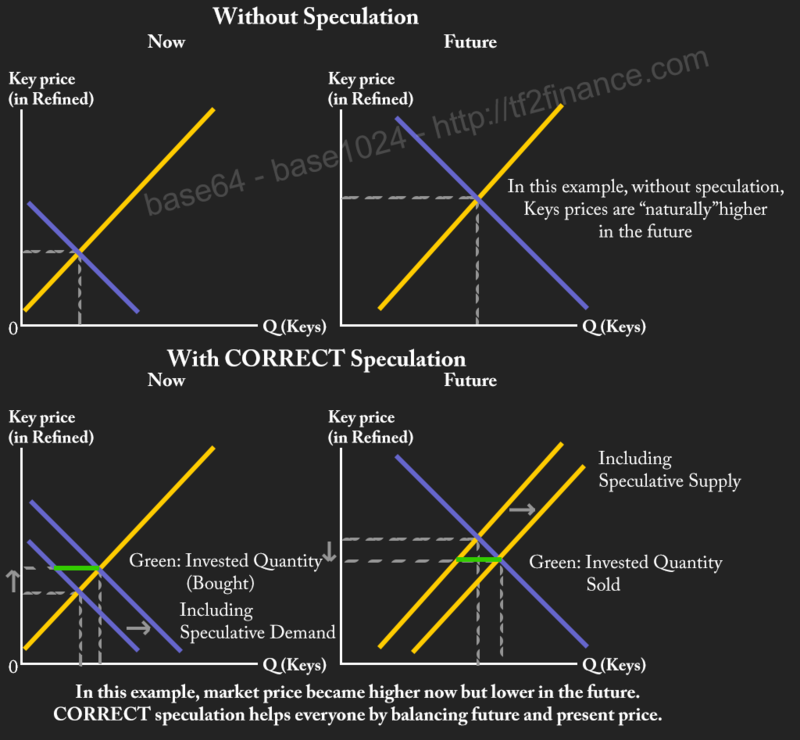 The key point is that Speculators may or may not benefit the market. Exact Consumer Surplus and Producer Surplus (Profit) are not discussed here. However, arguments like “1 Key for your 2 Keys” is pure nonsense because the bid-ask spread for Keys have remained at 4 scraps, i.e. +/- 2 scraps. There is no indication that profit for each Key reselling throughout the day has increased, compared to the days of 2.44 ref. In TF2, Item drops represent income. Since every hat can be traded away for currency, or for another hat directly, our spending might be dependent on Wealth. There are two important assumptions on how users choose their wealth bundle. 1. Monotonicity: More is preferred to less. Two Hat A is better than One Hat A; (2 Hat A + 1 Hat B) is better than (1 Hat A + 1 Hat B). Compared to 1 year ago, we have much more choice in keeping and wearing hats. Craft Hat is no longer the only choice. We have Strange Festive Weapons, 8 types of Botkiller Weapons, 12 Keys cheap Unusuals, expensive Miscs, Uncraftables, Holiday Promos, Genuines and more. As the economy expands, our income and wealth increases, and the prices of items depend on individuals’ tastes. There are two special types of taste towards items. 1. Homothetic Tastes: Always trade until the final quantity of different item groups have the same ratio in total value. 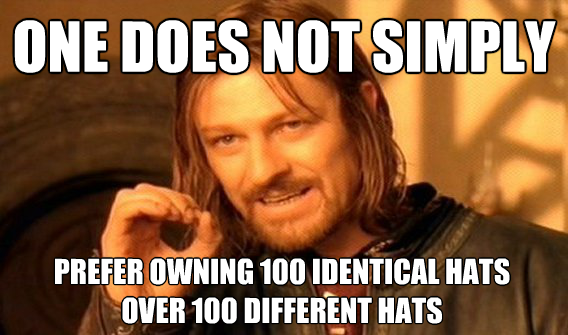 For example, if at current market prices, a user settles at owning 30 Craft Hats (1.33 ref each) and 10 Misc (4 ref each). If somebody suddenly gives him 40 Refined for free, he would just spend half on craft Hats and half on Misc. 2. Quasilinear Tastes: Always trade until the final quantity of certain item reaches a preferred number, and spend the rest on all other items. For example, if at current market prices, a user settles at owning 30 Bill’s Hat and 30 Genuines, and he has Quasilinear Taste at Bill’s Hat (because there is only 30 paint possible). If somebody suddenly gives him 40 Keys for free, he would just spend all on additional Genuines, none on additional Bill’s Hat. It is possible that most traders have owned enough Craft Hats already, and those cheap Hats became Quasilinear. Therefore, both Refined Metal and Craft Hat have decreased in USD value (Real value). The change of individual’s Preference between Keys and Metal for payment, investment and savings is behind everything. Consider donating and keep the site alive.